Art in History is an interesting little book. Handbag sized, it’s ideal for reading a chapter at a time, in waiting rooms, on the train or over coffee in a cafe. It’s written for people like me who are interested in art, but don’t know enough about it. And as the title suggests, it’s about the way art intersects with historical events and how we can enjoy art more if we know more about this. I found the early chapters the most interesting, probably because I could relate more to the kind of art Kemp was discussing. He begins with a chapter on Greek and Roman art, and how it came to serve both religious and secular purposes, how it became able to express human emotion and pain (as in, for example, the Laocoon in the Vatican), as well as great events such as the Battle of Alexander against Darius, which can be seen in the Pompeii mosaic. He then goes on to consider the arrival of Christianity which created a kind of crisis in art because the Bible proscribed ‘graven images’, as the Islamic religion still does today. Fortunately for the development of Western art, Pope Gregory the Great sanctioned the use of religious images because they could stimulate devotion, and they could tell the stories of the Bible for the illiterate. This is a very interesting chapter which discusses the role of icons in the orthodox church, Gothic art, and the ways in which the Church managed to find ways of defending the sophisticated religious image-making which emerged over time. Then, of course, there is a chapter on the Renaissance, and the age of patronage, and the influence of Humanism on art which aimed to imitate nature. In this chapter and the following one about the role of the academies and the bourgeois, Kemp discusses paintings which would be familiar to many readers so it is easy to follow his train of thought and to enjoy the discussion. So although I’m the first to admit that I’m no expert on art of any kind, I didn’t find these chapters very convincing. I don’t think this is because I am prejudiced against modern art, because I find some of it visually beautiful and/or thought-provoking, and even when it’s downright ugly, sometimes I find the ideas underlying such art to be interesting and worthwhile even if it’s confronting. It may be that the format of this little book just doesn’t allow enough space to discuss the 20th century, which is IMO the most difficult period to understand because there are so many art movements and some of them are rather alienating. Another limitation is the use of B&W reproductions of the art works. 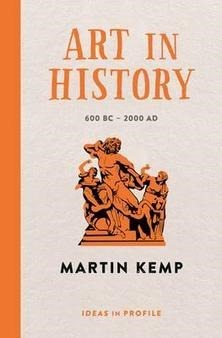 Art in History is not an expensive book (RRP $19.95 in Australia) so of course it doesn’t have expensive glossy paper with full colour, full page illustrations. The images serve only a reminder of the art work, which is only ok if you know the paintings in question, or can find them on the web with the help of Google. Still, for an overview of the movements which shook up the art world in the 20th century and more bizarre postmodernist attempts to do the same, this little guidebook is very useful. However, while I appreciate that the cartoons which ‘animate’ the book are intended to unify this publisher’s Ideas in Profile series, I found them lame: I don’t think they contribute anything to the book and indeed they just take up space that could have been better used. You can listen to an interview with the author at ABC Radio National. I have this reserved from the library already, a quote from it popped up in another book I was reading and it sparked my interest, so I’ll be glad to compare notes when it arrives and I’ve read it. It’s interesting that he picks on Duchamp’s Fountain and makes assumptions about the artist’s motives on making it though – it was actually made by a female artist, Baroness Elsa. She gave it to him to put forward for an exhibition and instead he claimed it was his and there was nothing she could really do about it once she realised what had happened. That story of Duchamp’s hijacking is fairly widely known (though it’s often whitewashed as ‘collaboration’). Ooh, how interesting! I’ve checked the book and no, it doesn’t mention her at all, though it does say in passing, in the quotation from the magazine, “whether Mr Mutt made the fountain with his own hands or not has no importance He CHOSE it.” (p170). I, not knowing anything about Baroness Elsa’s claim, assumed that this was a reference to the urinal being bought from a shop that sold urinals! Having said that, the book isn’t indexed, so it is possible that there is a reference to her somewhere else, but I don’t recall seeing it. To be fair to Kemp, this is only a little book, 230-odd pages, and he probably didn’t have space to buy into this controversy. It may not be a fair analogy but it would be like writing a Beginner’s Guide to Shakespeare and not mentioning the Bacon controversy. I’m not sure that the comments on the impact of Rothko’s work is necessarily snide. The power of his art rests in the impact on the viewer, whether dark or uplifting. The old Tate in London had a room for Rothko’s work and viewers reports similar, varying responses. I can attest to that too. We have Rothko’s Red in the NGV here in Melbourne, and there are always people standing around it making comments of one sort of another. Now, maybe I’m reading into this something that isn’t there, but when I see that word ‘strove’, it implies trying without necessarily succeeding; and I see the insertion of the words “to its adherents” to imply that the art may only have meaning to them and not necessarily to anyone else, perhaps not even Kemp. I see his choice of a quotation which makes someone like me consider all the lovely paintings I’ve seen with eyes and smiles which are still in good condition, in contrast with something created recently which is already “rather cracked”. Juxtaposing the “traditional notion of the sublime” with anything that “the artist says is a work of art” , and calling it extreme is, on the one hand perhaps merely a description of this kind of art, but on the other (as I interpret it) a judgement which finds that kind of art wanting in comparison. LOL, Kim, I don’t know! He’s a Big Noise in the art world, but hey, maybe he moonlights on TV.